Finches will party down on this feeder. It is available for nyjer or black oil sunflower, please specify. Holds approximately two cups of food. 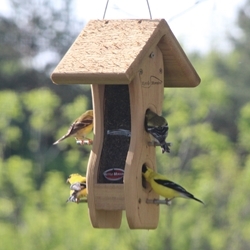 You can also use our Mealie Snax in this feeder. Hand made from solid cedar & stainless steel screw construction. Aluminum perches that won't rot. Removable polycarbonate windows for easy cleaning. Bottoms drain quickly to keep fresh, healthy, & mold free. Stainless steel cable for hanging.